Eliezer Álvarez does not have any MLB stats for the season. Eliezer Álvarez (pronounced ah-LIE-zurr)… Has one daughter, Yizlenny. Began the season with Springfield (AA)... Was on the DL with a left ankle sprain, 5/16-7/30; included a rehab assignment with Gulf Coast League Cardinals (R)... Batted .360 (27-75) in 23 home games compared to .171 (19-111) in 31 road games... Had a season-high 6 RBI, 8/19 vs Corpus Christi... Was outrighted and then traded to the Phillies on 9/6 when he was optioned to Lehigh Valley (AAA)... Played for Escogido in the Dominican Winter League. Recognized as a Baseball America Low Class A All-Star and Midwest League Mid-Season All-Star in his first full professional season, leading the organization in doubles (36) and stolen bases (36), ranking T2nd in triples (6) and 3rd in hits (140)...Ranked among Midwest League leaders in average (4th, .323) on-base percentage (2nd, .404) slugging percentage (3rd, .476), OPS (2nd, .879), stolen bases (1st) doubles (2nd), extra-base hits (5th, 48)...Paced ML second basemen in games (113), total chances (505), putouts (173), errors (27) and double plays (69)...Hit safely in 91 of 116 games, with 38 multiple-hit efforts...Batted team-leading .351 (40-114) with runners in scoring position. Also was 4-for-9 (.444) with the bases loaded...Hit .436 (17-39) in the ninth inning or later...After opening campaign 16-for-71 (.225) in 18 April games, ended the year batting .343 (124-362) over final 98 contests. It was the 9th-highest average among full season minor leaguers over that time period...Selected as a reserve for the West Division squad in the Midwest League All-Star Game in Cedar Rapids, Iowa. Went hitless in two plate appearances...Reached base safely in 27 consecutive games from 5/27-6/26, hitting .356 (37-104). Was 6th-longest streak in the league...Was 1-for-7 (.143) with a double in two postseason games in the Midwest League Playoffs...Named the No. 19 Midwest League propsect by Baseball America following the season. Also recognized as the Low Class A "Best Defensive Second Baseman" by the same publication's "Best Tools" survey...Added to St. Louis' 40-man roster (11/18)...Appeared for Leones del Escogido in the Domincan Winter League following the season. Named to the Appalachian League Post-Season AllStar team...rated as the No. 10 prospect in the Appy League at the conclusion of the season by Baseball America...ranked among Appy League leaders in batting (.314, 7th) and doubles (20, T3rd)...ranked 6th among Cardinals minor leaguers in batting and 10th in slugging (.451)...hit safely in 40 of 52 games...led Appy League second basemen in double plays turned (30)… batted .341 (14-41) off opposing left-handers and .316 (22-61) with runners in scoring positon. Rebounded to bat .353 (24-68) with one home run and 15 RBI in 21 games during second straight season with GCL Cardinals …twelve of his 24 hits went for extra bases (1 HR, 5 3B, 6 2B)…his five triples were tied for the 8th-most in the Cardinals organization…batted .405 (17-42) off opposing righthanders…appeared defensively in 14 games at second base… went hitless (0-for-4) in only postseason game in the Gulf Coast League Playoffs (7-4 loss to Red Sox). Appeared in 20 games for the GCL Cardinals, hitting .209 (14-67) with one home run, two doubles, three triples and seven RBI…appeared defensively at second base (8G), third base (7G) and left field (1G). Began professional career with DSL Cardinals, hitting .205 (36-176) with two home runs, five doubles, 15 RBI, 10 stolen bases in 53 games…recorded best month in July, when he hit .269 (18-67)…was 8-19 (.421) in the 9th inning or later… appeared defensively at shortstop (23G) and second base (10G). 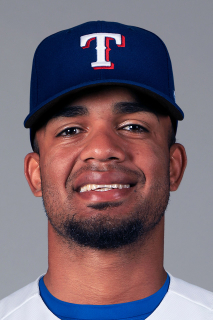 February 24, 2019 OF Eliezer Alvarez assigned to Texas Rangers. December 4, 2018 Leones del Escogido placed OF Eliezer Alvarez on the reserve list. October 13, 2018 OF Eliezer Alvarez assigned to Leones del Escogido. June 2, 2018 Texas Rangers sent LF Eliezer Alvarez outright to Frisco RoughRiders. May 29, 2018 Texas Rangers designated CF Eliezer Alvarez for assignment. May 22, 2018 Frisco RoughRiders activated CF Eliezer Alvarez from the temporarily inactive list. May 18, 2018 Frisco RoughRiders placed CF Eliezer Alvarez on the temporarily inactive list. May 8, 2018 Texas Rangers optioned CF Eliezer Alvarez to Frisco RoughRiders. May 7, 2018 Texas Rangers recalled Eliezer Alvarez from Frisco RoughRiders. March 22, 2018 Texas Rangers optioned CF Eliezer Alvarez to Frisco RoughRiders. March 21, 2018 Philadelphia Phillies traded 2B Eliezer Alvarez to Texas Rangers for cash. March 16, 2018 Philadelphia Phillies designated 2B Eliezer Alvarez for assignment. March 9, 2018 Philadelphia Phillies optioned 2B Eliezer Alvarez to Reading Fightin Phils. October 2, 2017 Philadelphia Phillies recalled Eliezer Alvarez from Lehigh Valley IronPigs. September 6, 2017 Philadelphia Phillies traded RHP Juan Nicasio to St. Louis Cardinals for 2B Eliezer Alvarez. September 6, 2017 Philadelphia Phillies optioned 2B Eliezer Alvarez to Lehigh Valley IronPigs. July 31, 2017 Springfield Cardinals activated 2B Eliezer Alvarez from the 7-day disabled list. July 23, 2017 Springfield Cardinals sent 2B Eliezer Alvarez on a rehab assignment to GCL Cardinals. July 18, 2017 Springfield Cardinals sent 2B Eliezer Alvarez on a rehab assignment to GCL Cardinals. July 18, 2017 2B Eliezer Alvarez assigned to GCL Cardinals from Springfield Cardinals. May 16, 2017 Springfield Cardinals placed 2B Eliezer Alvarez on the 7-day disabled list. March 28, 2017 2B Eliezer Alvarez assigned to Springfield Cardinals. March 13, 2017 St. Louis Cardinals optioned 2B Eliezer Alvarez to Palm Beach Cardinals. November 18, 2016 St. Louis Cardinals selected the contract of Eliezer Alvarez from Peoria Chiefs. October 20, 2016 2B Eliezer Alvarez assigned to Leones del Escogido. August 6, 2016 Peoria Chiefs activated 2B Eliezer Alvarez from the 7-day disabled list. July 23, 2016 Peoria Chiefs placed 2B Eliezer Alvarez on the 7-day disabled list. April 2, 2016 2B Eliezer Alvarez assigned to Peoria Chiefs from Johnson City Cardinals. March 29, 2016 2B Eliezer Alvarez assigned to St. Louis Cardinals. August 31, 2014 2B Eliezer Alvarez assigned to Johnson City Cardinals from GCL Cardinals. June 21, 2013 2B Eliezer Alvarez assigned to GCL Cardinals. June 2, 2012 SS Eliezer Alvarez assigned to DSL Cardinals. July 2, 2011 St. Louis Cardinals signed free agent SS Eliezer Alvarez to a minor league contract.